Palm Sunday is a Christian festival day. It is always happens on a Sunday but the date each year changes. It is a day to celebrate the day that Jesus entered the city of Jerusalem in Israel as was written about in the Bible in Mark 11:1-11, Matthew 21:1-11, Luke 19:28-44, and in John 12:12-19. 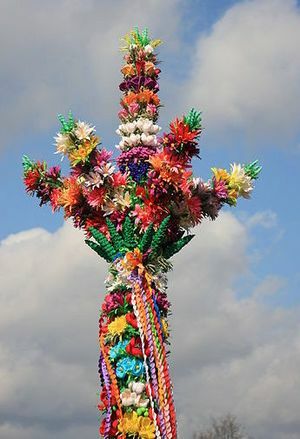 During Palm Sunday many Christians celebrate with Crosses made out of Palm leaves and by going to church. Jesus riding on a donkey in his triumphal entry into Jerusalem, depicted by James Tissot. Rings and accessories made of palm leaves in celebration of Hosanna (Palm Sunday). Palm leaf rings in celebration of Hosanna in Ethiopia. Flowers (in this instance marigolds) strewn about the sanctuary in an Oriental Orthodox church in Mumbai, India on Palm Sunday. A priest blesses palm fronds in Santiago Apostol Church in Plaridel, Bulacan, Philippines. A palm in Łyse, Poland. “Flevit super illam” (He wept over it); by Enrique Simonet, 1892. Palm Sunday Facts for Kids. Kiddle Encyclopedia.